Microsoft's "Windows Insider" fast track is living up to its name, with build 10162 released yesterday, making it three builds in four days since 10158 appeared on 29 June. One difference this time round is that you can download the ISO image in one of 22 languages. The download page is headed "April update" at the time of writing, but expand the downloads and you find build 10162. The ISO image enables testing of clean installs, and suggests that this may qualify as a "slow" preview; the more stable builds which are made available to all testers. This is also implied by a tweet from General Manager Gabe Aul, who said this morning that the 10162 ISOs are "ahead of Slow ring release". So far, there is no further official comment on what is new, though I noticed that the wallpaper selection bug we reported last time round has been fixed. You can expect few or no substantial changes before release, other than continued efforts to fix bugs. One thing I spotted in this build is a new Microsoft Wi-Fi app. 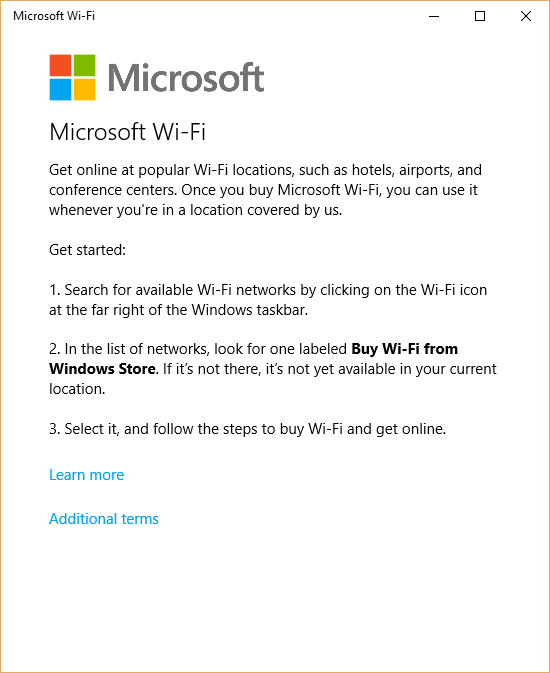 When you click to see what Wi-Fi hotspots are available, some may be labelled "Buy Wi-Fi from Windows Store". Select one of these and you can purchase time through Windows. The "Learn More" link is dead and it would not be surprising if this is USA-only to begin with. Support will depend on deals with Wi-Fi operators, so its extent is unknown. Note that although Microsoft is offering a free upgrade to Windows 10 for most Windows 7 and Windows 8.1 users, this does not mean that all those systems will be compatible. Some hardware will not have Windows 10 drivers, and in this case the upgrade offer is meant to be suppressed.